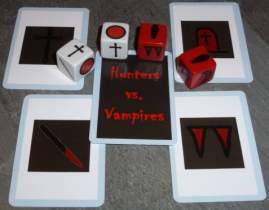 Hunters versus Vampires is a dice game where players take on the roles of vampires and vampire hunters and roll dice in an attempt to defeat their enemies. KORPG™ is proud to announce our second released product. You can now purchase the drop dead cool dice game Hunters vs. Vampires exclusively from the KORPG™ online store. I Shoot Randy! is a card game where one player takes on the role of Randy and must survive the onslaught of attacks from the other players by countering the effects of their played cards. 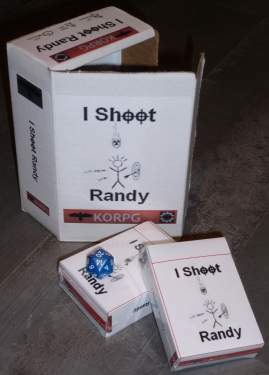 KORPG™ is proud to announce that you can now purchase I Shoot Randy! exclusively from the KORPG™ online store. I'm Kevin Oedekoven and quite simply, I love games. I love how games bring us together. I love all the fun and challenge that come from games. In short, I think playing games is a part of the human condition. And so, I make games. 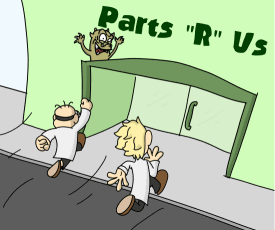 Card Games like: Mad Scientist: The Game, Swimming with Sharks, Up And Down, I Shoot Randy! Board Games like: Politics: The Boardgame, Happily Ever After, For Truth and Justice! Because I want to make games that you will be proud to own and excited to play, I promise to bring you quality games that you can play with your friends and family. I want to provide you with games you can play with your kids or neighbors at the dinner table with an expectation of fun. Consider this an invitation to check out the games I've released as well as those I'm currently developing. See if anything strikes your fancy. I'd also like to welcome you to join in on the forum and development discussions. I'm always willing to hear another point of view and look forward to hearing about any fun you've had playing the games I've made. I think it's your move. Copyright 2008-2019 ©KORPG™ | All rights reserved.